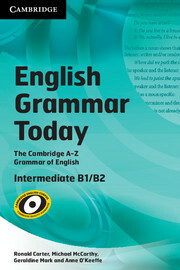 English Grammar Today is an indispensable guide to contemporary English grammar and usage, supported by a practical Workbook for grammar practice. 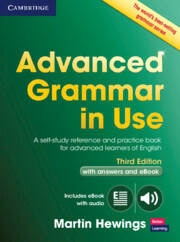 With extensive corpus research, the grammar book provides over 500 entries organised into an easy-to-use A–Z structure and the Workbook provides hundreds of exercises that allow learners to practise the grammar covered in the main book. Authentic examples of written and spoken English place the grammar in context and the clear explanations make it ideal for intermediate learners of English at CEF levels B1-B2, including those preparing for IELTS or Cambridge English exams such as Preliminary and First.